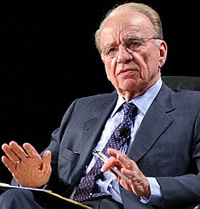 The UK Department of Trade and Industry has referred Rupert Murdoch’s Sky purchase of nearly 18% share holding in major UK broadcaster ITV. This action won’t be unexpected at Sky, Ofcom and the Office of Fair Trading recommended this back on 27 April this year. Sky has released the following statementSky notes today’s announcement by the Secretary of State for Trade and Industry. We look forward to engaging with the Competition Commission as the ongoing regulatory process enters its next phase.Translation: Bring it on.